Summary: Extended wear contact lenses have become a popular option for contact lens wearers because of their flexibility and longevity. Extended wear contact lenses may be the perfect option for you if you are looking for a product that is both cost-effective and comfortable. Now, contact lenses are available for two different wearing schedules: daily and extended wear. But, what is the actual difference between the two, aside from the obvious one is for daily use while the other can be used longer. 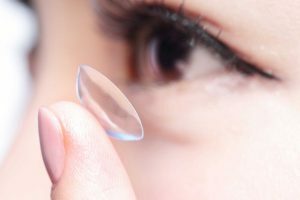 Most extended wear contact lenses are thinner than daily wear lenses and are designed from silicone hydrogel. This advanced material enables EW lenses to allow more air into the lens, promoting breathability. The more oxygen the cornea receives, the more comfortable you will feel with these lenses on. This is especially important when contacts are worn throughout a long day or for extended periods of time. Numerous extended wear lenses are approved for up to seven days of wear and at least a couple more brands of hydrogel lenses allow you to wear them for up to 30 days. It is important to note that you should not exceed the recommended schedule of wear time as some people’s eyes may dry out the lens faster than others. Older models of extended wear contact lenses were not favored by eye doctors due to the risk of an eye infection. New lens materials have helped solve this problem however. Because certain EW lenses may allow patients to wear them overnight, practitioners were torn whether they should recommend them as the usual procedure involves taking them out before sleep. Another concern was that bacteria and other potentially dangerous microorganisms can get trapped into the lenses and in the eyes. These microbes thrive in warm, moist settings, and can cause a rather serious infection if not treated. Blog submitted by Lens.com: Lens.com can help you find the lowest-priced daily contact lenses on the market. To learn more, visit Lens.com online today.